Who’d give more? Jewelry in auction. Dear Magpie, do you know that in April the record for the highest bid on the jewelry auction was broken? Currently this status is enjoyed by The Pink Star ring, a pink, 59.60-carat diamond sold for $ 71.2 million! This precious stone has become my excuse to tell you a bit about the auction market, where not only works of art reach horrendous amounts! But let’s start with the basics. The market of works of art is certainly unique. Here the value of the item is not decided upon objective facts but rather how the buyer evaluates the given objects. And believe me, dear Magpie, the prices at the auctions have really many zeros. You’ve probably heard that Picasso’s, Bacon’s or Van Gogh’s works have beaten the price record. The price that you probably heard then would make a lot of Magpies dizzy. For example, one of the most expensive works of art (Paul Gaugin’s “Nafea Faa Ipoipo”) cost more than $ 300 million! For this amount, Magpie, you would buy 3 most luxurious apartments in New York or 1000 properties in Warsaw. Surely for many the work of art auctions are very enigmatic events. A group of the richest people holding numbers, paintings with unspecified shapes and a man who repeatedly hits the table with a gavel. These are probably the most common associations. I’ll tell you, Magpie, that it looks way more interesting when seen in person. Each auction starts with the so-called starting price, that is the lowest amount for which the work of art can be sold. How is it that sometimes the hammer price (the price of artwork sold without tax and commission) is often several times higher? On the one hand, the atmosphere of the place is conducive to continuously raising prices – the auctioneer encourages customers to raise their numbers and at the same time does not give them a lot of time to think, but on the other hand, often willingness to buy a given work is so great that the price does not matter. After all it is an art to invest in art. The market of works of art, however, is not only paintings, graphics or sculptures. In the largest auction houses also jewelry has been auctioned for over 200 years. The two most important institutions I want to tell you about are Christie’s and Sotheby’s, founded in the 18th century in London. Sotheby’s story begins in 1744, when Samuel Baker, a bookseller, establishes an auction house at first dealing primarily with the antiquarian market. It is here that in 1968 jewelry is auctioned for over $1 million for the first time ever! For a substantial amount of $ 1.1 million a Cartier’s 69.42 carat ring was purchased. Sotheby’s also launched a trend of selling jewelry collections of famous stars and celebrities. 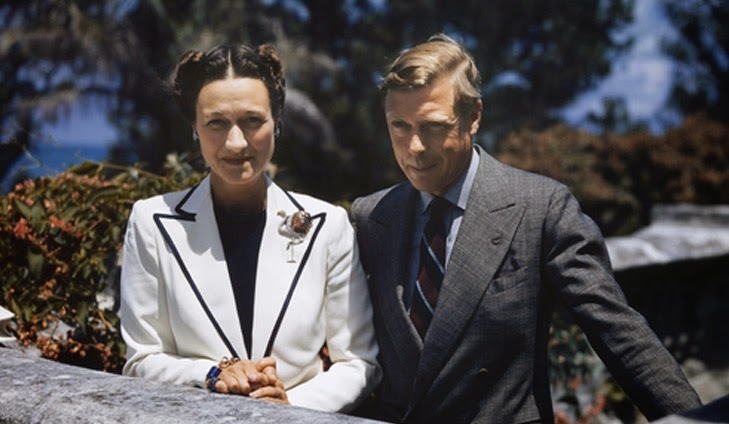 In 1987, there was a historic auction of the jewels of the Duchess of Windsor – Wallis Simpson, who was the wife of the successor of the English throne Edward VIII. Her collection of jewelry was auctioned for $ 50.3 million. 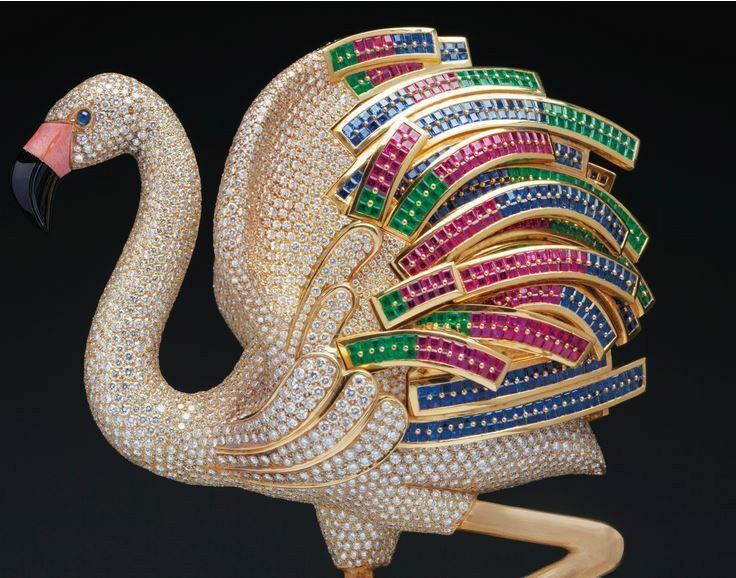 Among the auctioned items there were the famous Cartier brooch with flamingo and panther. photo: Princess of Windsor with Prince Edward. Cartier’s flamingo brooch on lapel. The second largest auction house – Christie’s – was established in London in 1766 by James Christie. Here probably the most important contemporary jewelry auction took place, when in 2011 the auction of Elizabeth Taylor’s collection was organized. The actress was known for her love for expensive stones, hence the result of the auction did not surprise anyone – $ 137.2 million. Among the auctioned jewelry was the famous emerald set from Bulgari, which the star wore incessantly. Year after year more and more jewelry records are set at the jewelry auctions. Are you curious, Magpie, what are the three most expensive stones of the world? The first place is taken by the previously mentioned The Pink Star, sold on April 4 at Sotheby’s in Hong Kong. The ring with a pink 59.60-carat diamond was a gem at the jewelry auction and was auctioned for 71.2 million $! It is the largest and most transparent pink diamond in the world. The second place holds the Oppenheimer Blue, blue 14.62- carat diamond owned by one of the most important families dealing in obtaining gemstones in Europe, that is the Oppenheimers. The ring was auctioned in 2016 in Christie’s in Geneva for 57,5 million $ and it took only 20 minutes! Third place has The Blue Moon – 12.03-carat diamond was sold in 2015 in Sotheby’s in Geneva for 48.5 million $. Such a jewel tempted a Chinese businessman Joseph Lau who bought the diamond for his 7-year-old daughter Josephine. Thus the stone is now called The Blue Moon of Josephine. If you are interested in jewelry auctions, Magpie, May is going to be a real treat for you! Below you will find links to the most important auctions. Is the clock already ticking for natural diamonds? Audrey Hepburn and her breakfast at Tiffany’s.